MARBUENA ISLAND is a Philippine Private Island Resort that you will always rememer because of its unique features. On the Island, you find: white sand, beach, corals, sea, underwater marine life, boating, island hopping, trekking, abundant nature, trees, clusters of rainforest, birds, bats and butterflies. MARBUENA ISLAND is a quiet tropical island, the perfect nature paradise. A place to dream, to play, to relax, to read, to taste good local food, to walk around, to swim and snorkel. 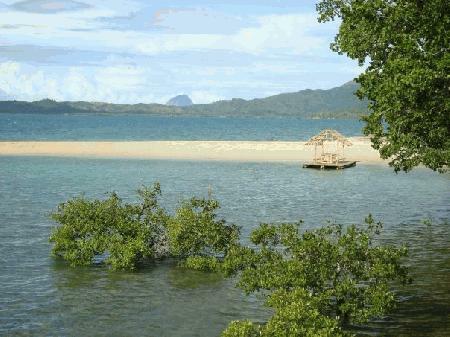 A truly Filipino island with a romantic south sea setting. Accommodation varies from fan-rooms to fully air-conditioned rooms. But most important: you have a whole island only to yourself. hi.. how much is you room rate per night? good for 15-20 persons i guess?my entrance fee po ba? thanks ..
good day! tag pila room rates and cottages nyo? Are there cottages in this resort? how much is the entrance per person?. Is there foods served in this resort? gud day! can u gve me your different room rate for sept. 14 2011. I need a room for 2 person and a room for 5 persons. kung magdadala ba kami ng own food, do you charge for that? hindi to over nyt. . moring til afternun lg. . thank u soo mch! ASAP po. .
what is the rate per person or per room for group of 8. and how could we reach ur resort. pls advise us. can you send me your rates for overnight stay and the prices of your restuarants. thanks! Your phone number is either not yet in service or invalid. Kindly update. can i ask for the room rates per day and if how much is the room or house rates for a group..
Can you send me your roomrates? Pls give me rates for the room for a 3 days 2night stay pls... and does it include buffet breakfast too? Thankyou! hi!..im planning to visit Iloilo on Aug. with my husband and my kid, can u please send me d room rates and the inclusions, and if possible some pics .... Thanks much! Can you post a copy of the room rates and are there any food stops which we could buy some foods??? ?thanks....id be happy to reciv an email with you guys...thanks!!! We are planning to visit your place. can you give us the room rate per day. Complete details please. Ty. how much the room for 2 persons?? Hello i just want to know the rate of your room per day with aircon and cr..
i was there last saturday. I enjoyed the place and the people are so hospitable. Although we only had electricity from 6pm-6am. But it's a perfect place for nature trippers. we paid 3700 for the room. and its good for three people. How much is your cottage rate per night and how many persons can accomodate per cottage. how much is your room rate per night for couple? how much is your standard rate? magkano rate ninyo for 3days,aircon room with cr and tv. dis place is really great!!! !i want to go back there...its a peaceful place and full of nice spots!!!! my friends are planning to have a summer break at the beach resort..we're planning overnyt stay..we're 8 in the group....so, can u pls give me your different room rates, specifically rooms that are good for 5-8 persons...then other facilities, and othe afctivities that you offer in your resort. can you pls send me the rooms rates. thank you! HI! Can you please email me with your room rates and amenities?Thanks a lot. Hi, Kindly PM me your rates asap, planning to go this week, and how to get to the resort. Thanks. Hello! Can you please email me with your room rates and amenities?Thanks a lot. hello marbuena resort!!! just want to ask bout the rate of rooms rather the package rate as of today,, because we're planning to have our teachers bonding specifically by our department this coming december 2009, Im expecting for your early response for us to prepare our budget. thank you very much!!!!!!!!!!!!! Please send me your room rates for two persons. How far are you from iloilo city? How can we get there from iloilo city? Thanks. can u post or send me your room rates? any promos?any information for me to plan our trip there. the whole family is going home for vacation next year. we want to plan or reserve in advance. thank you!! have a nice day!! pls send me your rates. looking for a room gud for 5 persons..
Hi, please send me room rates and boat fare. thanks... Do you have a retaurant 24/7? pls send me room rates & accomodation description..(preferred date of stay on 1st week of jan.. thanks! may i know how far your resort in iloilo city proper? and tell me the room rates and other activities that you offer.. thanks.. i'm looking forward to go there in your paradise. hello gud pm. can i ask for your contact number? tnx. hi how much is the rate to stay in for a week? good for 4 persons. hi, what would be the room rates for an overnight stay? can i have ur room rates?good for 2 persons for june 26-28 2009..
hi im a travel agent from manila,i would like to request a contracted rates..pls send it to this email address justfly_travel@yahoo.com..our contact no. is T-(632)4210919 and TF-(632)4408880,,thank you very much..
Hi! Can I know your group package rate?!.. good for 20person. Thanks. hi, I would like to inquire if the resort has a day tour service? if yes, how much will it cost / person & time covered? How much is your room rate for 4 person and what is included? we're planning to have it on the 18th of april. how much would a room cost? there will be at least 8 people coming. please advise. thanks. i'd like to inquire about the room rates and its capacity. our group is planning to stay overnight. can i get your room rate and availability for 2 persons, May 30 check in check out May 31? also, other amenities. thanks! rate for room air con from april 2-5.. do you have transfer service to and from the resort island? please give me your different room rate for april 5-8, 2009. I need a room for 2 person and a room for 4 person. Do you have availability March 17-20 for 2 people? How much would it be and what is included? Thank you so much! can u give me a room rate for two person, planning to be there on april 22 til 24 09 thanks..
how much is your standard rate?can you give the rates a day?